During the last summer (summer of 2006, SSN virtually nil) a fellow ham Marcus, SM5UTT, and myself had the chance of trying out some experiments with a homebrew loop. We started off with an ordinary delta-shaped (triangular) loop with an urge to make it directional by attaching a parasitic element to it. It could not be higher than some trees in the garden… or just outside the garden actually, and we had to use insulated wire for the elements. Due to size and low sunspot number we settled for a 10 MHz version of the antenna. A round of MMANA-simulations showed that such a parasitic loop beam would be a very competent antenna indeed. Simulations also revealed a method of constructing the antenna that does not make use of anything but a SWR meter and a transmitter from the rear direction. As always I want antennas to be prunable in situ and the method developed fulfills that wish. Lets first have a quick glance of what constitutes a traditional, single-wire, loop. Common ham-lore declares the loop as the ultimate antenna for many hams. Is that really so? It turns out that such a wide statement can be both right or wrong. A single-wire loop has a circumference of circa one wavelength. The actual “loop” can be in the shape of a circle, square or triangle, the difference in radiation is small enough not to cause concern. It is nice to find an antenna that is so indifferent to physical realisation. A fact that surely has helped make it so popular. It is hard to make it not work! A triangular loop can be made for predominantly horizontal (delta loop) or vertical (nabla loop) polarisation. For mainly horizontal polarisation the triangular loop is erected with a horizontal wire at the top and with feeding point in the lower corner. See fig 1A. This is the traditional delta loop even though it does not really look like the greek character delta (Δ). I call this a “nabla” loop from the mathematical operator with that name, ∇. To achieve vertical polarisation one corner of the triangle should be highest with a horizontal wire parallell to ground at the bottom. A true delta loop, (Δ), arrangement. The feed point can be in one of the lower corners (fig 1B), but the antenna as a whole will have some horizontally polarised radiation which results in an upward “bubble” in its radiation diagram. This “bubble” is OK if we expect to use the antenna for both DX and local QSO:s but is detrimental for pure DX-operation. A much better feed point in the latter case is as in fig 1C in one of the slanting legs. With a fed point a quarter of a wavelength from the top of the triangle the horizontal radiation components essentially cancels. Now the current distribution is such that the vertical legs act as two phased quarter wave elements. The antenna, in fact, turns into a kind of half-square beam as described elsewhere on this site. As the horizontal radiation cancels, the upward “bubble” does the same, and instead a very sharp minimum appears in zenith direction. This is very beneficial when looking for DX, as nearby interference reflected in the ionosphere right above the antenna, is rejected very substantially. It also makes this set-up singularily unsuited for local contacts. For maximum gain with a pair of phased vertical elements they shall, according to theory, be parallell and at a distance of about 5/8 wavelengths from each other. The nabla loop is an approximation of sorts to this condition. The maximum current is found in the lower parts of the elements. As most of the radiation emanates from the high current sections of the antenna we do not lose much gain by tilting the top of elements as in the delta, (Δ), loop. From this, we also conclude that if we increase the mean distance between the elements (by making the base somewhat longer than 1/3 wavelength) some extra gain can be achieved. As the base gets longer we slowly turn this antenna into a folded dipole which is not what we want! Figure 1. The single wire loops. Figure 2. Simulated radiation from the three different loops discussed. Note the remarkable difference between B) and C), despite the very little change in feed point! The impedance of A) is some 130 ohms while both B) and C) exhibit about 75 ohms. Feeding A) can be done through a simple quarterwave 75 ohm coax stub. The rest of the feed line from this point can be made out of 50 ohm coax of any length. A 4:1 balun can also be employed. For B) and C) directly connecting 75 ohm coax is sufficient. Either way, a choke balun at the feed point is preferred and not to be overlooked. It is very easy to make any one of the loops above. Start off with a wire somewhat longer, say 5 percent, than a full wavelength. Successivlely cut off the wire making the loop smaller while checking for lowest SWR (i.e. not necessarily SWR 1:1). The antenna has quite a wide bandwidth so it is not necessary to be too picky or precise when trimming it. To get back to the initial question: Yes, the loop can be a good antenna both for local and DX but it depends on its orientation and feed point. Until now the loops discussed have been more or less omnidirectional. As with e.g. Yagi-antennas we can achieve directionality by adding a reflector element. In our tests we used a reflector element of identically the same size as the driven element. The reflector element was positioned about 0.125 wavelengths from, and basically parallell to, the driven element. Since we now have a large number of parameters that determine the end result (loop length, reflector length, distance between them, height above ground etc.) a method is called for that leads to a functioning antenna no matter what these parametres are. Since we have not found such a methodology in the literature before, we will state its five steps here. See also figure 3 below. Start off with a loop according to one of the variants found in figure 1. Hang it up in its final position, height above ground etc. Attach a coax, preferably via a choke balun, to the loop. Now shorten the loop successively while having an eye on the SWR. Stop cutting when the lowest SWR (possibly 1:3 or even larger) is reached. Take the antenna down, measure its length and cut off 5 percent more. For antennas of the type B) or C) (See fig 1), make the cuts in the lower horisontal leg. For the type A) try to keep both slanting legs the same length. Now take it down and make an exact replica of it with the final dimensions from above. This is to become the reflector. Place a small transmitter in the milliwatt range — or possibly a bribed ham — behind, or at least within a 30 degree sector from straight behind, the reflector element. Make certaing the transmitter is not too close. A distance of at least 5-10 wavelengths should be sufficient. Adjust the reflector’s impedance until the signal received is as its lowest. The antenna is ready for use! With these five steps you will always end up with a working antenna with best F/B and close to optimal gain. Unfortunately the method does not give any guarantees as to what the resulting SWR is. It turned out not to be unreasonably large however. Feeding with 75 ohm coax was sufficient during our tests. Ideally a small LC-net could be employed at the antenna to lower the SWR. We did not find that crucial in our tests. Figure 3. We made two parasitic loops according to fig 1A) and 1C). A) is horizontally and C) is vertically polarised. “M” is the feed point on the driven loop and “R” is where the reflector impedance is attached. 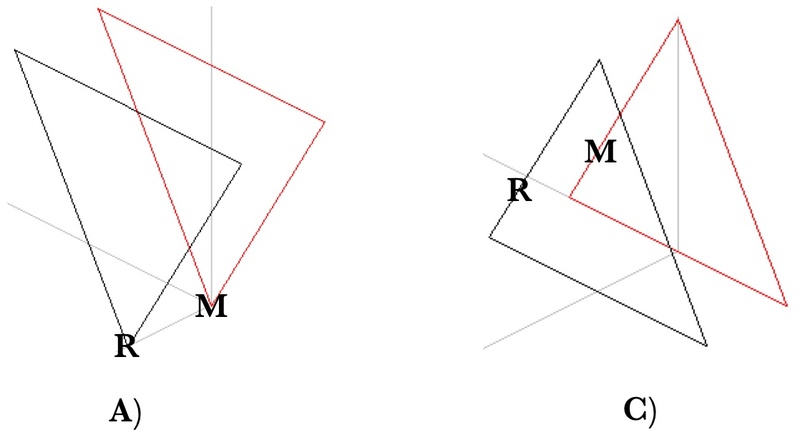 Note that C) is not fed in the corner of the triangle. Figure 4. The loops according to MMANA. C) is a much better DX-antenna due to its lower take-off angle and its rejection of signals from above. This is even though the actual gain of this antenna is lower than the one at A). The antenna at A) has more gain but receives also much more noise and QRM from local and medium range transmitters. We felt that the extra gain was of no use in our DX-hunt. We arranged the antenna according to figure 3 during the span of a couple of weeks. Starting off as a vertically polarised antenna and the lowest leg about 2 metres above ground level we got a SWR of about 1:3. We fed the antenna with 50 metres of cheap 75 ohm coax. A choke made out of some 15 turns of the coax onto a piece of ferrite rod was employed. The antenna was directed due east as we had a clear run through the foliage in that direction. After a few weeks the antenna was redressed as a horizontally polarised one. The tests were performed during sunspot minimum 2006 (SSN as low as it gets). With vertical polarisation we could now, for the first time, run JA-stations on a regular basis in the eveneings. There is no doubt that the simulated low take-off angle also exist in reality. We heard some europeans (middle distance) but they got weaker the longer west they were. We could engage a few german stations but no french or british. The radiation diagrams show a sideways rejection of some 10-15 dB so while the european stations did not completely vanish they did not interfere either. Unfortunately the antenna was pointing slightly north of east so UA9:s came in like thunder while JA:s were weaker. No VK:s were heard throughout the test period. The very first QSO was with West Malaysia though, so the antenna is not completely useless even for stations slightly off the main lobe. The situation changed completely when we rigged the antenna for horizontal polarisation. We still heard JA:s but were unable to contact them with our 100 watts. UA9:s were still no problem at all. The most remarkable difference was the amount of europeans that suddenly crowded the band! The upward “bubble” in the diagrams in figure 2 is quite real! Generally speaking the change of polarisation made the QSO-rate increase rapidly. But the pure DX:s were very much harder to find. The band grew more crowded and the QRMs were heavier. A side-effect of this polarisation was that All India Radio (AIR) at 10.330 MHz came in very loud and clear. This is outside of the antenna’s design frequency, but it ain’t half bad there either. According to the general formula the reactance, R, can be calculated from a known inductance, L, at a specific frequency, f, as R=2*3.14*f*L. A series of coils could be made and inserted into the reflector. But this is a slow and cumbersome method. What we did in the end was using about 4 metres of 450 ohm ladder line with a 150 pF variable capacitor in place of the short in one end. The other end went to the reflector. This way it was very easy to adjust the load by simply rotating the capacitor shaft. We could also repeat the trim procedure for different frequencies (of no real use on such a small band as 10.1-10.15 MHz it turned out) and several rear transmitter locations. This is the preferred method. Believe us!